Six students from Baruch College’s Master’s in Financial Engineering (MFE) program broke three records at the University of Toronto’s 13th-annual Rotman International Trading Competition (RITC)—the world’s premier contest of its kind that drew teams from 52 universities around the world including from Carnegie Mellon, Columbia, Duke, MIT, Princeton, NYU, and the University of Chicago. In a supercharged environment, Baruch’s MFE team earned more points—49.4—than any team has gotten in the competition’s history. The win marked the first time that any team placed #1 in three of the event’s six competition areas, and the 3.5-point gap between Baruch and the second-place team, LUISS University of Rome, is the largest ever between the top two slots. MIT had held this record since 2011. “It is an understatement to say that I couldn’t be happier and more impressed with our team’s showing in this year’s competition,” said Dan Stefanica, PhD, co-director of the MFE program. “We have been on a trajectory of continuous improvement but this year, we had a strong strategy behind our preparation and it really paid off.” This year’s team members were Sandeep Bangar, Allen Long Chen, Rui Ge, Anik Roy, Mingda Ke, and Raymond Wong. RITC presents teams with six simulated trading cases that closely mimic different aspects of real world markets. These include commodities trading, credit risk, sales and trading—each of which Baruch won—equity valuation, where Baruch placed second, and algo trading where Baruch ranked third. There is also a competition for quant outcry. Teams receive the cases three weeks before the competition date (held February 19 and 20 this year) so they can research and develop strategies that position them to earn the highest PnL. The competition is held in the state-of-the-art simulated trading floor at the Rotman School of Management at University of Toronto. During the three-week research period, Baruch’s team logged many hours in the Wasserman Trading Floor in the Subotnick Financial Services Center which is one of the largest and most technologically advanced educational facilities of its kind. The universities and colleges that participated this year, along with their standings, include LUISS University of Rome (2) and University of Calgary (3), financial engineering programs from NYU (8), Carnegie Mellon (11), UC Berkeley (12), Chicago (17), Columbia (19), Rutgers (33), Princeton (39), Boston University (43), and undergraduate teams from MIT (10), Dartmouth (21), and Duke (31), among others. But more broadly, Stefanica attributes Baruch’s success to a new elective course, “Fundamentals of Trading,” introduced in Fall 2015. Taught by Jarrod Pickens, PhD, a math professor who also served as the team’s coach, the course introduced students to a simulated trading book and led them to implement various trading strategies while managing the risk of their positions. The 14 students enrolled in the course competed individually and in teams against one another throughout the semester. 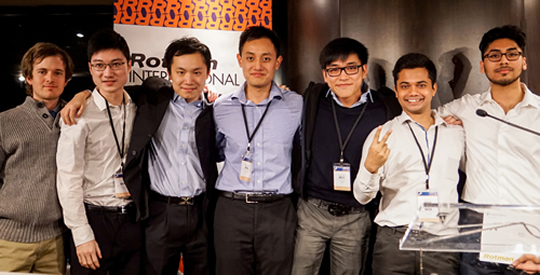 Through those competitions, a team of six was selected to represent Baruch at RITC. “In past years, training was an extra-curricular activity,” explained Stefanica. “People’s lives get busy, they miss meetings, or they’re unable to find a suitable time for everyone to get together so they can collaborate.” In fact, owing to issues such as these, in 2015 Baruch did not send a team to RITC for the first time since it initially entered in 2009. Moving training into a dedicated course solved many of those problems, Stefanica said. Even without such a solid training strategy, Baruch was among the top performers in previous years. In its inaugural RITC competition in 2009, the college placed #10. In 2011 Baruch climbed to #3, in 2012 it won both the #1 and #4 spots, in 2013 it came in at #3, and in 2014 it was #4. Eugene Krel, a Baruch College and Baruch MFE alum who coached four of Baruch’s MFE teams in the past and served as assistant coach this year, said that in retrospect, Baruch had almost stacked the deck against itself in its first competition but still managed to make an impressive first showing. Diversity has been a hallmark of Baruch College since its founding. The six players hailed from various boroughs around the New York metropolitan region and from places as far away as China, had different ethnic backgrounds, and several were the first in their family to go to college. None, however, had family backgrounds in finance and not all had undergraduate training in math or finance. Even with different backgrounds and motivations for choosing financial engineering, the team operated as a united front at RITC and in the end, had a tremendous bonding experience. In addition to the thrill of competition, RITC gives students real-world skills and a competitive edge in the job market. “Several of this year’s participants have solid internships or job offers already,” Stefanica said.